I owe my passion for family history to my parents and grandparents, who were great storytellers. Many a time they gathered with friends and relatives around the kitchen table, recalling stories that had been passed down through the generations. 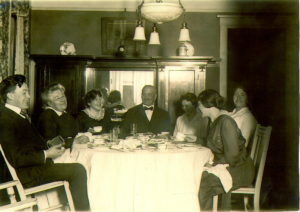 The McGinnis Family: from left to right, John, Mary Jane, Alice (McGinnis) Schiavon; Thomas McGinnis; Edith (Hoag) McGinnis; Eileen Sullivan; and Benita (McGinnis) McCormick; at the family home in Chicago, Illinois, early 1920s. As I entered my teens, I grew curious about the details. Whenever I’d ask a question about a story, my mother would send me off to bring back pen and paper. She’d have me write down the names of the relatives in question, where they lived and when, and before long we were diagramming connections and passing the paper around the table for everyone to add or correct information. I still have many of those scraps, some of which contained clues to mysteries that I would solve years later. I followed her advice and have been writing and researching our family history for most of my life. It seemed only right that these stories that were important enough for others to share should live on and not fade away in time. For that reason, I created Many Branches, One Tree. I agree with my mother about the value of history. In the case of genealogy, family trees give us a big picture of our ancestors, but without the stories to go with them, they are not much more than a list of names. Through this blog, I share our family stories – some known and some yet to be discovered – so we can go beyond the names and get to know the people. By connecting the stories about these ancestors with the factual events of their lives and putting them into cultural and historical context, I hope we can come to understand them better. My parents and grandparents were happy people, ever generous of spirit. They provided a welcoming atmosphere and always were ready to set another place at the table for the unexpected guest. In this way, they strengthened relationships and forged friendships that endured for generations, enriching all who were part of those connections. To this day, though my immediate family is not big, I love a full house and a crowded table. I see Many Branches, One Tree as a virtual family dinner table where you can drop by and stay a while to enjoy a story, add your own recollections and perspectives, ask (or answer) questions, and get to know one another to the extent you so desire. In the tradition of the family table, there is always room for one more, and all are welcome. Of course, my greatest reason for Many Branches, One Tree is to provide a place where my family, especially my children (and someday my grandchildren), will always have access to the stories and information behind the names on their family tree, even after I am gone. Some people leave breadcrumbs in their trail. I hope to leave cookies! Thanks for visiting. Feel free to stop by again anytime – and stay as long as you like. We’ve got a place at the table for you. Out of respect for their privacy, I generally omit the names of living family members, unless they have given permission. I do not air “dirty laundry” or confidential information. I may choose to write about a particularly trying time in someone’s life or an experience in which they made questionable choices. I will do this if I deem that (a) the subject relayed the story freely, either to me or to others, without reservations or (b) a story that has been handed down or otherwise learned through research has historic or redeeming value. The stories contained in Many Branches, One Tree are not meant to judge its subjects but to give an honest and accurate picture of the lives of the families and individuals contained here. The stories here reflect the customs, politics, and beliefs of the time in which they occurred. I believe in the inherent good of people but recognize that nobody is perfect. We learn from our life experiences and from those of others. By the same token, I make mistakes and hope readers will be understanding and forgiving of me when I do. Though most of the stories here are about ancestors in the extended Huesca and Tully families, some are about people or places that were dear to them and gave meaning to their lives. We do not live in isolation but owe much of who we are to the people who have influenced us in some way. For this reason, it seems fitting to acknowledge them here and thank them for being a part of our history and tradition, as well as for any influence they may have had on us. Perhaps the descendants of these people will stumble on their stories here and learn how they made a difference to someone they might otherwise have not known.